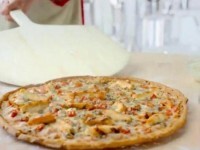 Sbarro recently released their new Sweet & Spicy BBQ Chicken Pizza, and I was able to try it yesterday. A large slice sells for about $4.50, but I received mine courtesy of Sbarro. 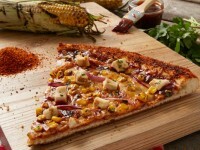 The pizza uses sweet and spicy BBQ sauce with red onions, grilled chicken, and cheddar cheese along with roasted corn, parsley, and a BBQ spice rubbed into the crust. 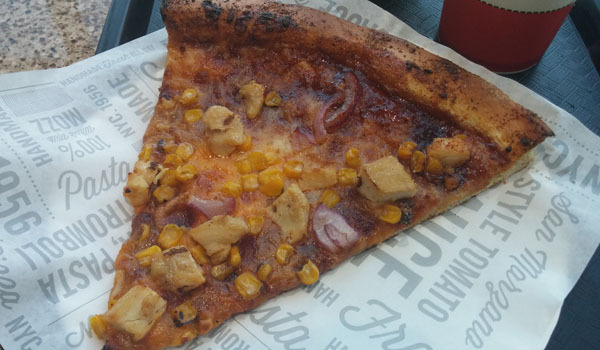 I was a little apprehensive about trying a pizza with corn on it. It isn’t something I’ve ever seen before. After I placed my order, the manager placed the pizza slice in the oven for about 3 minutes, which allowed the slice to be piping hot and sort of finish off the cook on the crust. I was incredibly surprised on how good this pizza tasted. 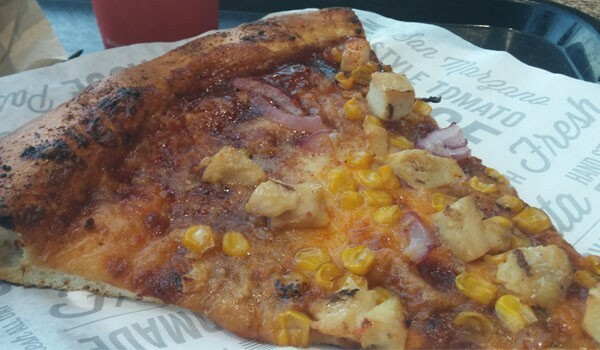 In my mind, the barbeque sauce was the real hero in this pizza. The sauce is not what you’d see from a regular barbeque pizza or even a barbeque sandwich. The sauce tasted exactly like the sauce from a rack of ribs on the grill. It was delicious, and just the right balance of sweet and smoky. The corn actually worked really well. It is roasted and also tasted like it came right off the grill, especially when combined with the sauce. The chicken had a great spice on it that tasted rubbed in. My only complaint with the pizza was it could have had more chicken. The chicken was really yummy; I could have just used bigger pieces and a bit more of them. The onions were a little more of an afterthought, but tasted nice combined with everything else. I might have preferred them to be cut a little smaller with more of them. The crust itself was great. 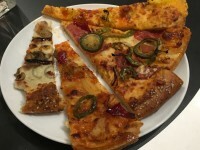 It had a great crunch to it, and was a little bit browned which really reinforced the smoky, barbeque flavor that the came off from the rest of the pizza slice. The best way to describe this pizza is that it combined all of the elements of a great summer backyard barbeque. I felt like I should be inviting people over and eating this pizza on picnic table. It included all of the barbeque elements together, not just the sauce, but the chicken, corn, and crust really reinforced the presentation. I could have used a bit more chicken (which is why I didn’t give it a perfect 5), but overall, I am surprised that the major pizza chains haven’t thought up this idea yet, because I would definitely order it again.